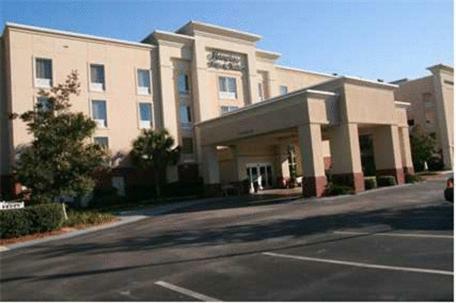 The University of South Carolina – New River is minutes from this Bluffton, South Carolina hotel. The hotel offers a daily hot breakfast and free high-speed internet access. Every room at the Hampton Inn & Suites Bluffton-Sun City includes a microwave and a mini-refrigerator. A work desk is also available in each room. Select rooms feature a sofa bed. Bluffton Hampton Inn & Suites offers an outdoor pool and a fitness room. A gift shop and a convenience store are available at the hotel. Hilton Head Island is a short drive from the Hampton Inn & Suites Bluffton. Okatie Creek Golf Course is located nearby. the hotel Hampton Inn & Suites Bluffton-Sun City so we can give you detailed rates for the rooms in the desired period.